Adar (Hebrew: אֲדָר‬ Adar; from Akkadian adaru) is the sixth month of the civil year and the twelfth month of the ecclesiastical year on the Hebrew calendar, roughly corresponding to the month of March in the Gregorian calendar. It is a winter month of 29 days. In the Hebrew Month of ADAR, we are entering into Joy! 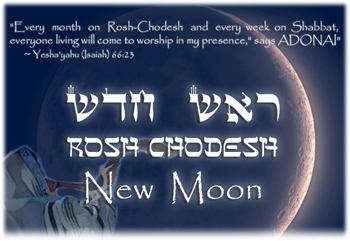 The Hebrew Month of ADAR is the last month of the year in YAH’S (a.k.a ELOHIM’S) cycle of feasts. The Hebrew Month of ADAR usually begins in the Gregorian Month of February and spills over into the Gregorian Month of March. Our Israeli (or Jewish) ancestors had very good understanding through the inspiration of RUACH HA KODESH (a.k.a HOLY SPIRIT) that each month has a Prophetic Significance and that one should pay attention closely. Every month has its own meaning and purpose in YAH’S prophetic plan!!! With this knowledge, our ancestors would gather for fellowship every FIRST FRUITS so as to honour the LORD YAHUVEH as well as seek revelation for the month ahead. Our ancestors knew that if they keep to YAHUVEH ELOHIM’S timing then they would prosper! ADAR being the last month of the year, implies the COMPLETION of a season! 12 Then all the people went to eat and drink and to send portions. They had a big, joyful celebration because they understood the words that had been explained to them. 7 Yahweh is my strength and my Magen. 9 Save your people, and bless those who belong to you. Be their Roeh, and carry them forever. The Hebrew Month of ADAR is the Month of the Feast of PURIM (a.k.a Feast of LOTS and FEAST OF ESTHER)!!! PURIM is the story of ESTHER! 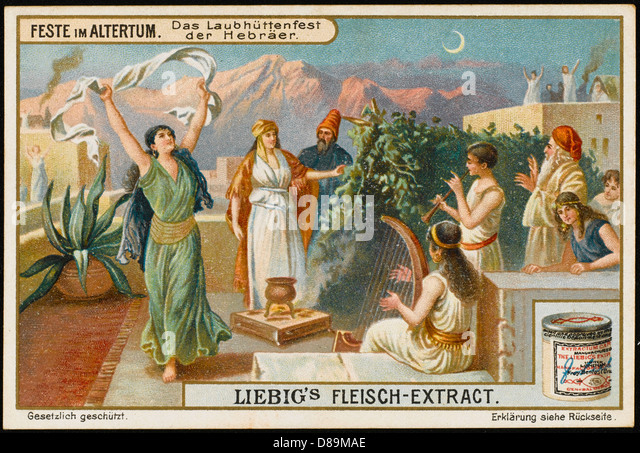 Esther was a young Jewish woman who was chosen to be the Queen of Persia because of her beauty. The Persian Empire was the greatest empire of that day and age. She had a task to go in before the King un-called/un-summoned in order to save her people from extinction at the risk of being executed. 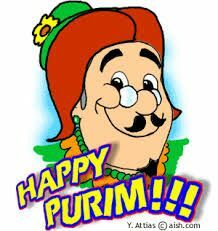 PURIM is therefore a TIME OF GREAT REJOICING!!! In PURIM, Esther revealed her true identity. What does this mean for us? Well, The Hebrew Month of ADAR is the Month in which YOUR NEW IDENTITY IS TO BE REVEALED! YAH has an identity for you. Your new IDENTITY is linked to the Spiritual Realm (a.k.a the invisible world) not to the Physical Realm (a.k.a natural)! It is not necessarily what you think. YAH wants you to discover your real or true identity which is in YAHUSHUA HA MASHIACH (a.k.a JESUS CHRIST/YESHUA) this month! Learn what you are in the LORD YAHUVEH! Discover the Spiritual Gifts given to you and how to use them to benefit those around you that you may bear good fruit for YAHUVEH ELOHIM! Start to move forward and higher toward your destiny in YAH! TIME TO GAIN FAVOUR WITH THE KING!!! TIME TO OVERTURN THE CURSE IN EVERY AREA OF YOUR LIFE!!!! TIME TO CELEBRATE THAT THE ENEMY HAS BEEN DEFEATED!!! TIME TO ENTER INTO JOY!!! In the Hebrew, Alphabet, there is a specific Letter which is usually associated with the Hebrew Month of ADAR! The letter is called the “KUF/KOF” also written as “QUPH/QOPH”. “”KUF/KOF” pictures “the eye of a needle”. What does this imply for us? Well, YOU MAY HAVE TO NAVIGATE A NARROW PLACE THIS MONTH AS ESTHER DID. Note that YAH gave Esther the revelation which would enable her to get through the narrow place victorious. YAH will do exactly the same for you! The nineteenth letter of the alef-beis is the kuf. The design of the kuf is similar to that of the hei. But while the hei represents holiness, the kuf represents kelipah, or unholiness. Both have three lines, two vertical and one horizontal. These three lines, depicting thought, speech and action in the hei, are also represented in the letter kuf, but its three lines represent unholy thoughts, profane speech and evil actions. These negative qualities are illustrated within the actual form of the kuf. Its long left leg plunges beneath the letter’s baseline. It represents one who ventures below the acceptable, an individual who violates the circumscribed boundaries of the TORAH. It is also significant that the head of the kuf is a reish (in con­trast with the dalet that comprises the hei). We said previously that the difference between the dalet and the reish is the yud in the right-hand corner of the dalet, representing GODLINESS. Given this, the difference between the holiness of the hei and the unholiness of the kuf is even more pronounced. One who is con­nected to YAH every moment of his life is perpetually warm and alive. On the other hand, coldness signifies an abyss—the sever­ance of the connection between man and YAH—and ultimate death. Now reverse the kuf and the reish and it spells the word reik, רק. Reik means “empty.” As we read in the portion of Vayei­shev:4 “The pit was empty (reik); there was no water.” The fact that the Torah says there was no water must come to teach us that there were snakes and scorpions.” We are told that Torah is synonymous with water. Without Torah, there is only poison and doom. What does YAH ask of you? Only to recite one hundred blessings daily. And how do we accumulate these one hundred blessings? One recites the Shemoneh Esreh (the Amidah) three times a day, which contains nineteen bless­ings each for a total of fifty-seven. In the morning prayers, there are an additional twenty-six blessings. Maariv, the eve­ning service, contains four more. Saying the “Grace After Meals” also has four blessings, plus two when we wash our hands and make a blessing on bread. It is thus quite easy to reach one hundred blessings in a day. The kuf, one hundred, represents death. But if one recites these one hundred blessings daily, one can transform a negative decree into a celebration of life. The name kuf in Hebrew means monkey. What is a monkey? A mimic, as in the well-known adage: “Monkey see, monkey do.” The letter kuf is also a mimic. It imitates the letter hei. It is the kuf’s extended left leg and the reish for its head that create the difference between life (hei) and death. on one hand, the kuf represents death and negative thought, speech and action. On the other hand, it invites trans­formation. Just as the design of the three-sided beis embodies a certain tension that is resolved in the four-sided mem, so does the foot of the kuf call out to be elevated from its station below the horizon. We all have the ability to transform the irrational to the superrational, thus directing our thought, our speech, and our action solely toward YAH and holiness. The Hebrew Month of ADAR is associated with The Israelite/Israeli Tribe of NAPHTALI. It means “SWEETNESS IS TO ME”. This is the Hebrew Month in which to taste the YAH’S sweetness, to taste and see that The LORD YAHUVEH is good as well as to enter into HIS JOY!!! 8 Taste and see that Yahweh is good. Blessed is the person who takes refuge in him. 9 Fear Yahweh, you holy people who belong to him. Those who fear him are never in need. but those who seek Yahweh’s help have all the good things they need. YAH wants you to experience HIS Goodness this month! YAH has good things for you this month! 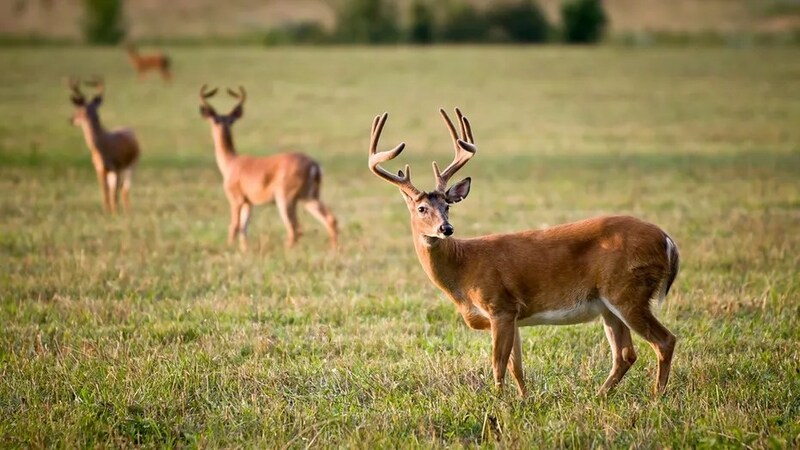 THE DEER GOES RUNNING AND LEAPING WITH GREAT JOY BECAUSE IT HAS BEEN SET FREE!!! This is what the Month of ADAR is meant to be like. ENJOY THE GOODNESS AND SWEEETNESS OF YAH Almighty! YAH wants you to rejoice. Remember that Satan/the devil hates JOY! The Holy Biblical Scriptures say that THE JOY OF THE LORD YAHUVEH IS MY STRENGTH! You will not have the STRENGTH to resist the enemy if your life is not filled with JOY! 47 You didn’t serve Yahweh your Elohim with a joyful and happy heart when you had so much. 11 But let all who take refuge in you rejoice. Let them sing with joy forever. Protect them, and let those who love your name triumph in you. 10 Brag about his holy name. 11 Search for Yahweh and his strength. or give a helping hand to wicked people. and your lips with happy shouting. 3 Yahweh has done spectacular things for us. as you restore streams to dry riverbeds in the Negev. 4 Always be joyful in the Lord! I’ll say it again: Be joyful! 5 Let everyone know how considerate you are. The Lord is near. 6 Never worry about anything. But in every situation let God know what you need in prayers and requests while giving thanks. 7 Then God’s peace, which goes beyond anything we can imagine, will guard your thoughts and emotions through Christ Yeshua. YAH exhorts you to be JOYFUL! YAH commands you to be JOYFUL! If you do not have THE JOY OF THE LORD YAHUVEH, then you are being disobedient! JOYLESSNESS IS A SIN!!! So ask yourself this, ARE YOU A JOYFUL PERSON? Research reveals that the early followers of YAHUSHUA HA MASHIACH (a.k.a JESUS CHRIST/YESHUA) actually listed joylessness as one of the 7 most deadly sins. They even added that being joyless is an actual refusal to enjoy YAH’S goodness! There is room to REPENT if you are not a very joyful person. but depression drains one’s strength. Science also says that a happy heart slows down aging and improves health! Laughter boosts the immune system! Laughter speeds the heart rate and improves blood circulation! Laughter increases Antibodies combating infections! Laughter causes the body to secrete the enzyme that protects the stomach from forming ulcers. Laughter alleviates depression, lowers blood pressure, Reduces Stress, Increases the Oxygen levels in our blood, Gives a sense of well being. Laughter immeasurably increases our enjoyment of life. A joyful heart is a testimony to the world! For the choir director; on stringed instruments; a psalm; a song. 1 May Elohim have pity on us and bless us! 3 Let everyone give thanks to you, O Elohim. Let everyone give thanks to you. 5 Let the people give thanks to you, O Elohim. Let all the people give thanks to you. 6 The earth has yielded its harvest. May Elohim, our Elohim, bless us. and may all the ends of the earth worship him. YAH wants you to be so blessed, so overwhelmed that the world around you says, “I want what you’ve got! I want to be as happy as you are” A JOYFUL relationship with your MAKER is contagious!!! You have control over happiness! JOY is not dependent on outside circumstances! YAH commands us to rejoice no matter what. Complaining is a sin! Remember the Children of Israel and the results of complaining. It costed them 40 years. They ended up entering the Promised Land 40 years later instead of 40 days. If YAH commands you to rejoice, then it means that you have a choice as to whether you are JOYFUL or not!!! Happiness should be a lifestyle and not just a habit! Everyone has both POSITIVE and NEGATIVE experiences and we choose which ones we focus on the most. If you choose to focus on and thereby form a HABIT of dwelling on the NEGATIVE EXPERIENCES, then you will be an UNHAPPY PERSON thereby missing the blessings that YAH has for you because you will find yourself wallowing in self-pity as we well depression and grumbling YOU CAN BREAK THIS HABIT BY REPENTING AND CHANGING YOUR WAY OF LIFE OR YOUR ATTITUDE TOWARDS YOUR CIRCUMSTANCES. However, if your habit becomes to focus on the POSITIVE experiences, then you will definitely be happy and also enjoy YAH’S blessings. In the Month of ADAR, you are to choose to REJOICE! This is a month in which YAH wants you to walk in JOY! When YAH asks you to REJOICE at all times, HE is not asking the impossible!!! 8 Finally, brothers and sisters, keep your thoughts on whatever is right or deserves praise: things that are true, honorable, fair, pure, acceptable, or commendable. 8 Finally, brothers and sisters, whatever is true, whatever is honorable, whatever is just, whatever is pure, whatever is lovely, whatever is commendable—if there is any virtue and if there is anything worthy of praise—dwell on these things. Don’t dwell on the negative!!! Focus on YAH’S blessing! It is then you will become a happier person!!! When I read the above Holy Biblical Scriptures, I remember or hear this song in my spirit. I thought I should share it. Get out of the house! Break out of isolation! Get busy. Get a Job either paid employment or voluntary work or both. Go to the gymnasium. Go swimming or walking or running or play football. Help the homeless. Join a choir and attend regularly. Create a daily schedule for yourself and work hard to ensure you follow it. Go to regular fellowship with believers in YAHUSHUA HA MASHIACH as led by RUACH HA KODESH ! Attend Sports events. One day a week, take a day off from work, relax and enjoy the blessings of YAH Almighty! Sabbath is not a sombre day of living under harsh rules!!! It is a day to enjoy YAH and be thankful keeping in mind that YAHUSHUA HA MASHIACH will return for HIS Bride and Guests on a Sabbath. We know not which one!!! Over the years, the Orthodox Jewish people have developed SABBATH into a FINE ART, that is to say that, on Friday nights, Family and Friends gather for a meal. The mother lights the Sabbath candles and thanks YAH for HIS gift of Shabbat/Sabbath! That is a way to welcome Shabbat. The father takes a glass of wine and a loaf of delicious bread and thanks YAH for HIS provision! It is passed around. Everyone tastes YAH’S goodness. As they eat their food, members of the family, talk and pray blessings over each other and sing praises to the LORD YAHUVEH! All through the day on Saturday, the family eats, their favourite foods and enjoys their favourite activities and acknowledges that they are experiencing the blessings of a good GOD! SABBATH IS A SET APART TIME!!! The Orthodox Jews call it: “SANCTUARY IN TIME”! YAH actually gives a PROMISE to those who observe SHABBAT . See Isaiah 58:13 – YOU WILL FIND JOY IN THE LORD YAHUVEH!!! 6 And I will remember the foreigners who have joined Yahweh to worship him, to love Yahweh’s name, and to be his servants. All of them will keep the day of worship from becoming unholy and will faithfully observe the conditions of my promise. 7 Then I will bring them to my holy mountain and make them happy in my house of prayer. Their burnt offerings and their sacrifices will be acceptable on my altar, because my house will be called a house of prayer for all nations. YAH will give the foreigners (a.k.a Gentiles) JOY if they take delight in HIS SHABBAT and House of Prayer!!! If you need more JOY in your life, YAH says, discover the blessing of SABBATH!!! This will also add YAH’S JOY to your life. 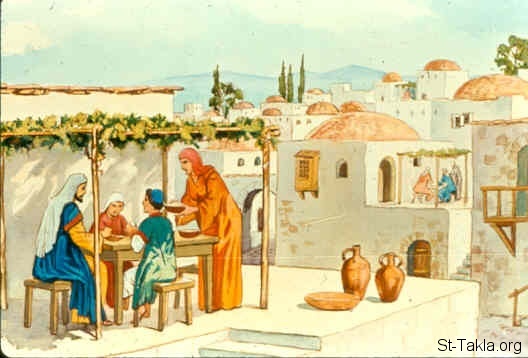 Let’s look at how Nehemiah described what happened when they were celebrating the Feast of Tabernacles/Shelters/Booths [a.k.a SUKKOT(H)]. 16 Then the people went out and brought them and made themselves booths, each one on the roof of his house, or in their courtyards or the courts of the house of God, and in the open square of the Water Gate and in the open square of the Gate of Ephraim. 17 So the whole assembly of those who had returned from the captivity made booths and sat under the booths; for since the days of Joshua the son of Nun until that day the children of Israel had not done so. And there was very great gladness. 18 Also day by day, from the first day until the last day, he read from the Book of the Law of God. And they kept the feast seven days; and on the eighth day there was a sacred assembly, according to the prescribed manner. According to verse 17 of Nehemiah 8, they were all filled with great JOY!!! What they did then in the days of Nehemiah, still works today! When we make a SUKKAH, we suddenly feel very JOYFUL! The Festivals are a time to get together with people you know and love, eat, drink and be merry and most importantly talk about YAH’S goodness!!! YAH says that if you celebrate HIS feasts, YAH will bless you and your JOY will be complete!!! YAH did not create the SABBATH AND MOEDIM (a.k.a Feast Days) to make us miserable but rather to bring JOY to us. Stop carrying baggage from your past! It only makes you bitter. Forgive and move one! You need to memorise the following Holy Biblical Scripture and practise saying to yourself. In a stressful situation, do what you can do or you know you are supposed to do and leave the rest to YAH to do. 7 Turn all your anxiety over to God because he cares for you. Choose to Praise YAH joyfully! See Psalm 103 where David commands HIS innermost being to praise YAH!!! 1 Praise Yahweh, my soul! Praise his holy name, all that is within me. so that you become young again like an eagle. for all who are oppressed. 7 He let Moses know his ways. He let the Israelites know the things he had done. or be angry with us forever. or paid us back for our wrongs. that is how vast his mercy is toward those who fear him. that is how far he has removed our rebellious acts from himself. so Yahweh has compassion for those who fear him. 14 He certainly knows what we are made of. He bears in mind that we are dust. 15 Human life is as short-lived as grass. It blossoms like a flower in the field. and there is no longer any sign of it. Yahweh’s mercy is on those who fear him. 19 Yahweh has set his throne in heaven. and are ready to obey his spoken orders. his servants who carry out his will. in all the places of his empire. King David wasn’t feeling joyful but he praised YAH anyway. King David instructed his soul (a.k.a inner most being) to praise YAH! In the process of endured and eventually became JOYFUL. Remember that part of the FRUIT OF RUACH HA KODESH is JOY! Let YAH’S River of JOY flow in and through you! The more you draw closer to YAH, the more you become filled with RUACH HA KODESH thereby increasing your level of Joy. When you get JOY, express it. YAH tells us to SHOUT FOR JOY! 4 Shout joyfully to Adonai, all the earth. Break forth, sing for joy, and sing praises. When you express your JOY outwardly, it intensifies!!! YAH wants you to know that you are not dependent on your circumstances for JOY! You can get JOY from your circumstances. YAH can and does bless you through your circumstances! YAH wants to always lead you into triumph over the enemy! Don’t be worn down by the cares of this world! As we enter into the Hebrew Month of ADAR, YAH wants you to know that THE OLD DEAD WINTER SEASON IS OVER AND DONE WITH. A New Season is Springing forth!!! YAH wants to bring you into a NEW SEASON OF REJOICING!!! In this month of ADAR, receive the JOY OF RUACH HA KODESH in YAHUSHUA’S name! AMEN! 7 Rachel’s slave Bilhah became pregnant again and gave birth to a second son for Jacob. 8 Rachel said, “I have had a great struggle[a] with my sister, and I have won!” So she named him Naphtali [My Struggle]. 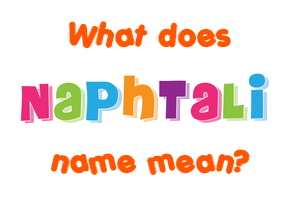 It is interesting that Rachel said the above words when Naphtali was born because when related to the Hebrew Month of ADAR and PURIM, the link is very clear. Note that in the PURIM story, we celebrate the victory over Haman who is the enemy of the Children of Israel. The Children of Israel had been struggling with the Amalekites for a very long time. In fact, it was King David whom destroyed most of them. However, later on in history, came Haman, a descendant of the Amalekites. He enacted his descendants actions. Praise YAH for Haman’s did not succeed! Even as Jacob and Esau had contended for the birthright, so also did Leah and Rachel contend (“wrestle”) in their child-bearing competition, each having the goal of bringing forth the son who would inherit the birthright. Rachel thought she was wrestling with her sister, while Jacob thought he was wrestling with his brother. In the end, they both discovered by revelation that they had been wrestling with God, and through this they learned the sovereignty of God. 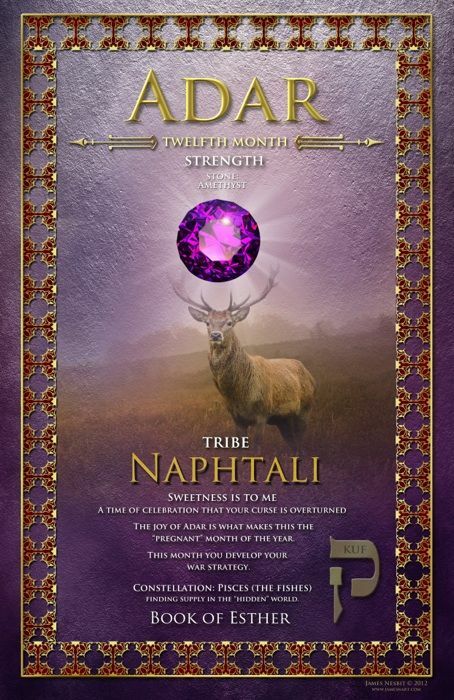 By these stories we see how Naphtali’s life was a prophecy. 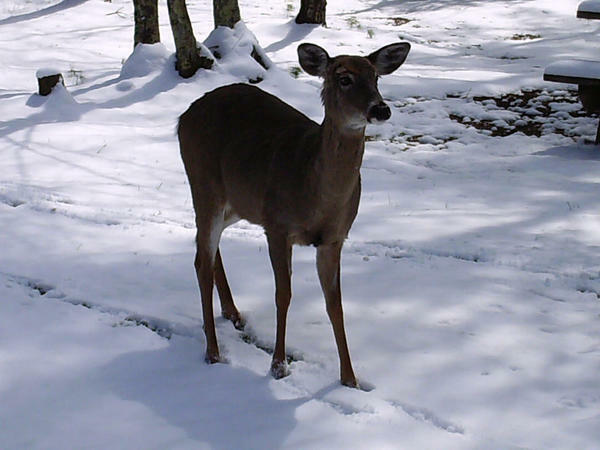 He pictures a long-distance runner—a stag—who endures to the end to become an overcomer. Jacob was a “heel-catcher” who caught up to Esau and passed him in the end. Rachel was childless and was soon far behind Leah in the competition for children, but in the end she too prevailed by bringing forth Joseph, the inheritor of the birthright. In the time of Joshua, when the twelve tribes received their inheritance, Naphtali was given land in the north above Zebulun. Asher was to the west, “Judah upon Jordan” to the east (Joshua 19:34, KJV). The main tribe of Judah was located far to the south, but apparently there was a settlement that went by the name of “Judah” that was located at the Jordan River as it flowed out south from the Sea of Galilee. One of their fortified cities was Chinnereth (Joshua 19:35), which is the Hebrew name for the Sea of Galilee. So the prophecy in Isaiah 9:1 about the darkness that was to come upon Zebulun and Naphtali and “Galilee of the nations” applied to the tribe of Naphtali. For this reason Jesus moved to Capernaum on the Sea of Galilee. The light of Christ thus came not only to Zebulun but also to Naphtali (Matthew 4:13-16). Zebulun was given the “gift” of light, but Naphtali shows how Christ “wrestled” with the people in His call to repentance (Matthew 4:17). By combining the two tribal blessings, Isaiah sees Galilee of the Nations as a long-term “marathon” project, where the light eventually wins over the darkness. Though Christ was the contender for the throne, He understood the long-term divine plan, and in this way he differed from both Jacob and Rachel, who thought that they had to force the issue in order to inherit. Jesus acted like a lamb and did not fight to obtain the scepter. His wrestling was in the area of preaching and teaching, for He had to contend with long-established traditions of men. His preaching, however, was eloquent, though He spoke in parables that many did not understand. Thus, multitudes came to hear Him, and many followed the light that He presented to them as a gift from God. 4 Adar (1307) – Maharam‘s body ransomed 14 years after his death by Alexander ben Shlomo (Susskind) Wimpfen. 4 Adar (1796) – Death of Rabbi Leib Sarah’s, a disciple of the Rabbi Israel Baal Shem Tov. One of the “hidden tzaddikim,” Rabbi Leib spent his life wandering from place to place to raise money for the ransoming of imprisoned Jews and the support of other hidden tzaddikim. 7 Adar (1828) – Death of Rebbe Isaac Taub of Kalov, founder of the Kalover Hasidic dynasty, and a student of Rabbi Leib Sarah’s. 13 Adar (161 BCE) – Yom Nicanor – The Maccabees defeated Syrian general Nicanor, in a battle fought four years after the Maccabees’ liberation of the Holy Land and the miracle of Hanukkah. 20 Adar (1616 CE) – ‘Purim Vinz’: downfall of Vinzenz Fettmilch and triumphant return of the Jews of Frankfurt under Imperial protection. The day was established as a community Purim for generations and to this day the Washington Heights community does not recite Tachanun on this day. 23 Adar (circa 1312 BCE) – Mishkan assembled for the first time; “Seven Days of Training” begin. 27 Adar (561 BCE) – Death of Zedekiah in Babylonian captivity. Meroduch, Nebuchadnezzar’s son and successor, freed him (and his nephew Jeconiah) on the 27th of Adar, but Zedekiah died that same day. 28 Adar (1524) – the Jews of Cairo were saved from the plot of Ahmad Pasha, who sought revenge against the Jewish minister Abraham de Castro who had informed Selim II of Ahmad’s plan to cede from the Ottoman Empire. To this day, Adar 28th is considered the Purim of Cairo, with festivities including a special Megilah reading.